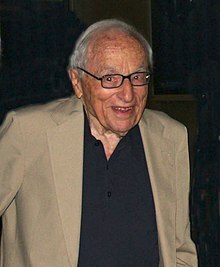 Walter Bernstein (born August 20, 1919) is an American screenwriter and film producer who was blacklisted by the Hollywood movie studios in the 1950s. Bernstein was born to a Jewish family in Brooklyn, New York, the son of Hannah (née Bistrong) and Louis Bernstein, a teacher. He attended Dartmouth College, where he got his first writing job, as a film reviewer for the campus newspaper, and where he also joined the Young Communist League. He graduated from Dartmouth in 1940. In February 1941 Bernstein was drafted into the U.S. Army. Eventually attaining the rank of Sergeant, he spent most of World War II as a correspondent on the staff of the Army newspaper Yank, filing dispatches from Iran, Palestine, Egypt, North Africa, Sicily and Yugoslavia. He wrote of his experiences in Palestine in an article entitled "War and Palestine". Bernstein wrote a number of articles and stories based on his experiences in the Army, many of which originally appeared in The New Yorker. These were collected in Keep Your Head Down, his first book, published in 1945. His screenwriting career began to emerge from the blacklist when director Sidney Lumet hired him to write the screenplay for the 1959 Sophia Loren movie That Kind of Woman. From then on Bernstein was able to work openly on films such as Paris Blues (1961) and Fail-Safe (1964). He also contributed, without receiving credit, to the screenplays of The Magnificent Seven (1960) and The Train (1964), and was one of several writers who worked on the script for the ill-fated Something's Got to Give, which was left uncompleted at the time of the death of its star, Marilyn Monroe, in 1962. Paris Blues marked his first feature film collaboration with director Martin Ritt, a friend since the 1940s (and himself a victim of the Hollywood blacklist); they subsequently worked together on The Molly Maguires (1970), which Bernstein also co-produced with Ritt, and The Front (1976). 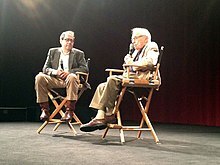 The latter film, a dramatic comedy about a restaurant cashier (played by Woody Allen) with no real talent or political convictions who is hired to act as a "front" for blacklisted television writers during the 1950s, earned Bernstein an Academy Award nomination for Best Original Screenplay and the WGA Award for Best Drama Written Directly for the Screen. The same year, Bernstein also made a cameo appearance in Allen's film Annie Hall. The following year he was nominated for the WGA for Best Comedy Adapted from Another Medium for Semi-Tough and again in 1979 he was nominated for a BAFTA Award for Best Screenplay for Yanks. In 1980, he stepped behind the camera as director of his only feature film, Little Miss Marker, a remake of the 1934 film based on the Damon Runyon story of the same name. He also wrote and directed one segment of the 1991 made-for-TV movie Women & Men 2: In Love There Are No Rules. In 1996, Bernstein published the book Inside Out: A Memoir of the Blacklist. In his memoirs, he tells about joining the Young Communist League at Dartmouth College in 1937, and the Communist Party itself the year after he left the U.S. Army. In 1994, he received the Ian McLellan Hunter Memorial Award for Lifetime Achievement in Writing, from the Writers Guild of America East. In 2008, the WGAE presented Bernstein with their Evelyn F. Burkey Award, given "in recognition of contributions that have brought honor and dignity to writers everywhere." Bernstein currently serves as a visiting instructor and screenwriting thesis adviser at New York University's Tisch School of the Arts in the Department of Dramatic Writing. Bernstein has been married four times. He has four children with his third wife Judith Braun: Joan Bernstein, Andrew Bernstein, Nicholas Bernstein, and Peter Bernstein. His fourth wife is talent agent Gloria Loomis. ^ McGillian, Pat (1997). "Walter Bernstein: A Moral Center". University of California Press. Retrieved June 11, 2016. ^ "Walter Bernstein Biography (1919–)". Film Reference. Retrieved June 11, 2016. ^ Walter Bernstein, 'War and Palestine,' The Tablet 1 February 2017. ^ "Faculty Directory". Tisch School of the Arts. Retrieved January 16, 2013. Ávila, Molly Rose; Zucker, Gregory (July 11, 2011). "In Conversation: Red Memories". The Brooklyn Rail. This page is based on the Wikipedia article Walter Bernstein; it is used under the Creative Commons Attribution-ShareAlike 3.0 Unported License (CC-BY-SA). You may redistribute it, verbatim or modified, providing that you comply with the terms of the CC-BY-SA.